Micheál Martin TD with Róisín O’Donoghue, Mary Immaculate Secondary School, Lisdoonvarna. Clare was well represented at the recent BT Young Scientist & Technology Exhibition. Students from Mary Immaculate Secondary School Lisdoonvarna, Scariff Community College, Ennistymon CBS, St Josephs Secondary School Spanish Point, St Josephs Secondary School Tulla and Scoil Mhuire Ennistymon presented their findings at the exhibition which took place in the RDS. Different projects from Co Clare students wanted to see if gender quotas impacted on voting patterns, if rushes could be used as a fossil fuel, do Irish beaches contain microplastics, is vegetation on limestone pavement in the Burren retreating or advancing. Others developed an app which would allow problems such as potholes be reported to a county council, the effects of attending single gender schools were outlined plus how the geometry of a sports bat affects the performance and much more. 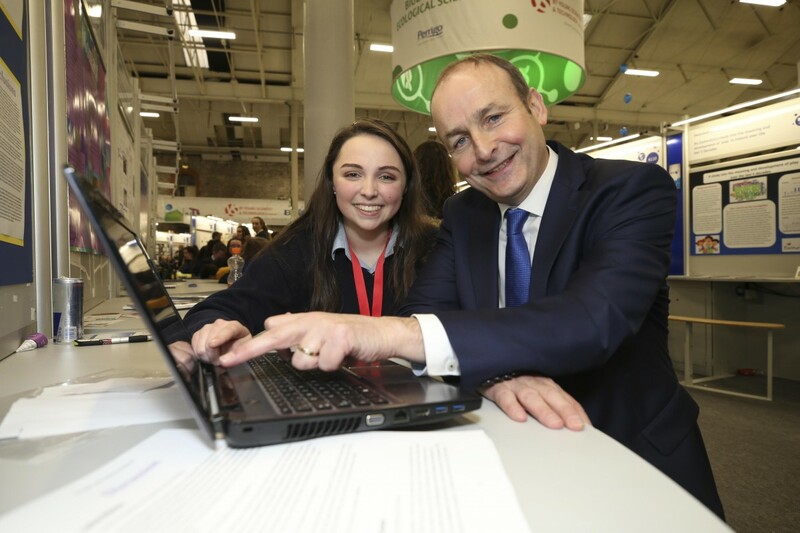 Leader of the Fianna Fáil party, Micheál Martin met with the young scientists from the Banner County and paid a particular interest in the project of Roisin O’Donoghue which examined whether or not gender quotas made a difference to voting patterns in last year’s General Election. In his most recent visit to Clare, the Cork T.D. spoke of the role the county played in Irish history by electing Eamon de Valera. “Eamon de Valera was a visionary leader and a practical patriot. The people of Clare gave him their support for forty years. This was his heartland – the place where he drew inspiration and was so proud to represent. Clare is a diverse and dynamic county. It combines an inspiring commitment to our traditions with being the home of many businesses, which are at the cutting edge of new technologies”. 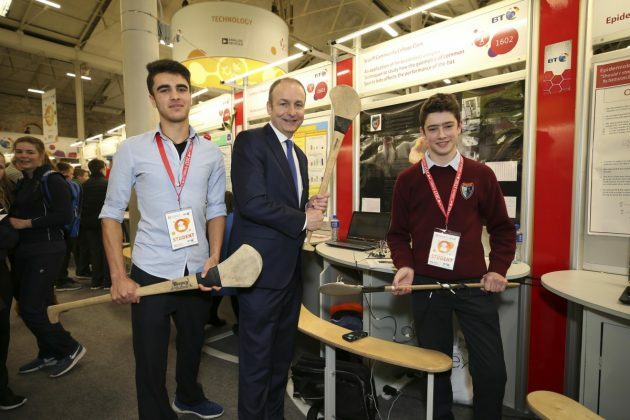 Aaron O'Brien (L) and Danny Hynes (R) from Scariff Community College with Micheál Martin TD. Micheál Martin TD, Mairead McSweeney (BT Ireland) and Dylan Egan from Mary Immaculate Secondary School. Micheál Martin TD with Siobhan Downes (St. Joseph's Secondary School, Spanish Point, Co. Clare. Micheál Martin TD with Róisín O'Donoghue, Mary Immaculate Secondary School, Lisdoonvarna. A full list of Clare entries in the BT Young Scientist & Technology Exhibition can be viewed below. School: Mary Immaculate Secondary School, Lisdoonvarna. Title: Could rushes be used as a fuel? Overview: I am looking at the feasibility of using rushes as a renewable energy source. Overview: I am writing an app which makes it possible for people to report problems in their areas e.g. potholes, flooding etc to their local council. Title: Does damage affect the strength of Laminaria digitata? Overview: I am looking to see if damage to the blades of Laminaria digitata affects their breaking strength. Title: An investigation into the composition of the gas found in the bladders of Ascophyllum nodosum and Fucus vesiculous. Overview: I am looking at the composition of the gas in the bladders of Ascophyllum nodosum and Fucus vesiculous and the effects of light on it. Title: An application of finite element analysis techniques to study how the geometry of common sports bats affects the performances of the bat. Overview: The project investigates if the position of the radius of gyration of a sports bat/hurley relative it’s sweet spot affects the performance of the bat/hurley. Students: Aaron O’Brien, Ciaran Hickey, Danny Hynes. Overview: I am looking to see if the gender quotas used in the 2016 general election changed peoples voting patters. Title: Do Irish beaches contain microplastics? Overview: We want to see if Irish beaches contain microplastics and if so, we want to quantify the amount of microplastics found in Irish beaches. Title: Is vegetation on limestone pavement in the Burren advancing or retreating? Overview: Our project is about testing how much iodine is in seaweed and compare it to the World Health Organisations recommended amount for an adult. Students: Micheál McInerney, Brendan O’Gorman, Darragh Nagle. Overview: To create an application that alerts motorists to nearby cyclists/motorcyclists in order to prevent accidents on Irish roads. Title: Challenge testing a cosmeceutícal cream containing the seaweed extract Fucus vesiculosis. Overview: Our project aims to challenge test a cosmeceutical cream containing a seaweed extract from Fucus vesiculosis to ascertain its antimicrobial efficacy. Overview: For our project, we have chosen to investigate the effects of artificially planted forestry on our island eco-system. Overview: We are investigating if you go to a single gender school or a mixed school will it effect your social skills in the future. Title: “Don’t sweat the small stuff” can drawings on sensory be used to increase understanding of ASD. Our ‘ideal transition year class’ – A science for all approach. Overview: To identify if there are gaps in understanding ASD in a transition year class. To increase understanding and support the ideal TY class. Title: Examining total metal content in river water in a Burren catchment area. Overview: I am looking at the total metal content in river water in a Burren catchment area and possible sources of those metals.